MPPs will be going back to Queen’s Park on October 20 but, during the week before, they will be in their local communities and in their constituency offices. Doubtless Liberal MPP’s will be feeling quite smug after their election win and telling people about how committed to ‘fairness’ and ‘social justice’ they are. The Raise the Rates Campaign, a coalition of poor people fighting back along with community and union allies, is not buying into Kathleen Wynne’s ‘social justice austerity’. 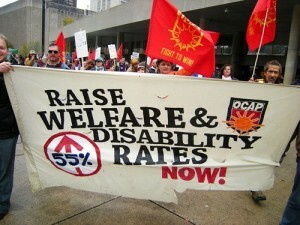 We are demanding living wages, decent income, the reversing of cutbacks and adequate and secure ODSP benefits. From October 13-20th, we’ll be going to MPP’s and provincial offices and Liberal events with our demands and holding events throughout Ontario. The Wynne Government is going to have to understand that people in poverty are fighting back. Panel and Discussion: Poverty in Guelph, Raise the Rates of Welfare and Disability Now! This entry was posted in Week of Action on October 2, 2014 by admin.